Since my son was born he was totally and utterly obsessed with trains. My life has revolved around trains until about 6 months ago. 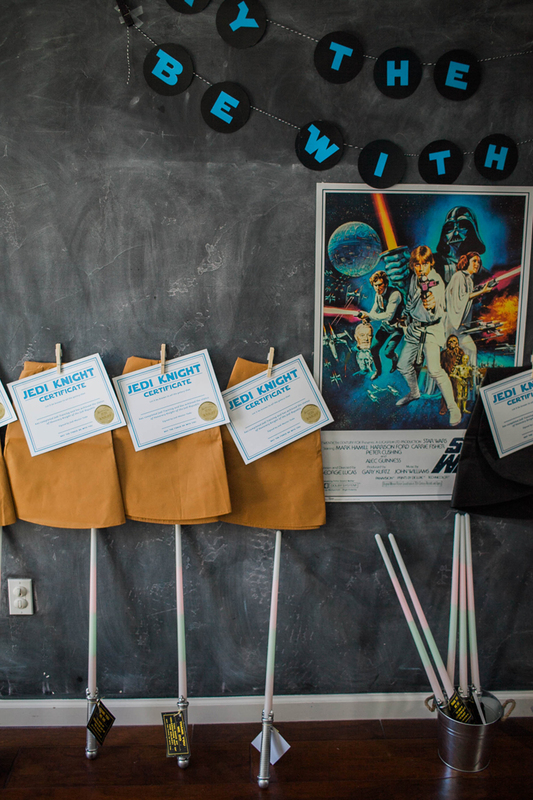 Preschool opened my little guy’s world to the fantasy world of Star Wars, and my days are now filled with sounds of lightsabers and yells of, “Use the Force Luke.” This welcomed change in obsessions was just in time for his fifth birthday party, which meant our party theme had to be Star Wars. 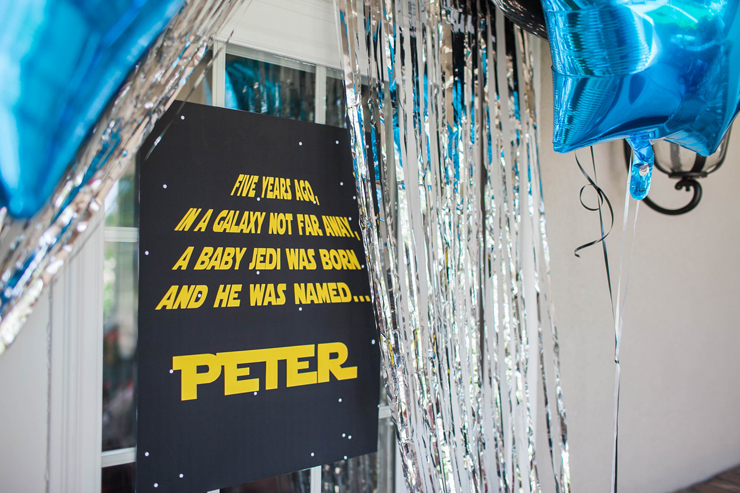 I had the best time creating a fun Star Wars Birthday Party for my sweet Peter, and the kids had an even better time battling the Dark Side! 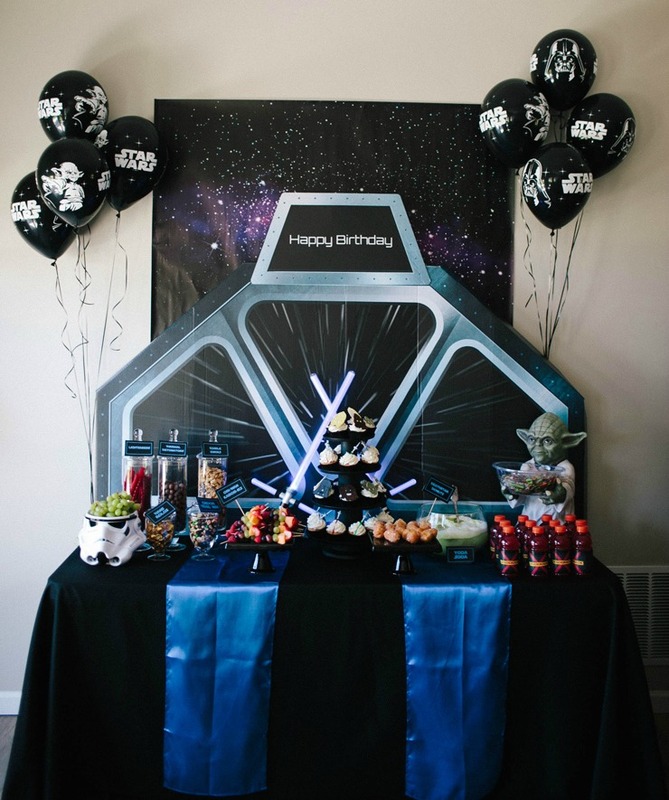 I am new to the world of Star Wars so planning the decor for the party took a little bit more time and research than usual. After much thought, I decided to go with a classic vintage Star Wars feel and look, rather than a new, trendier vibe. *Note: this post contains affiliate links. 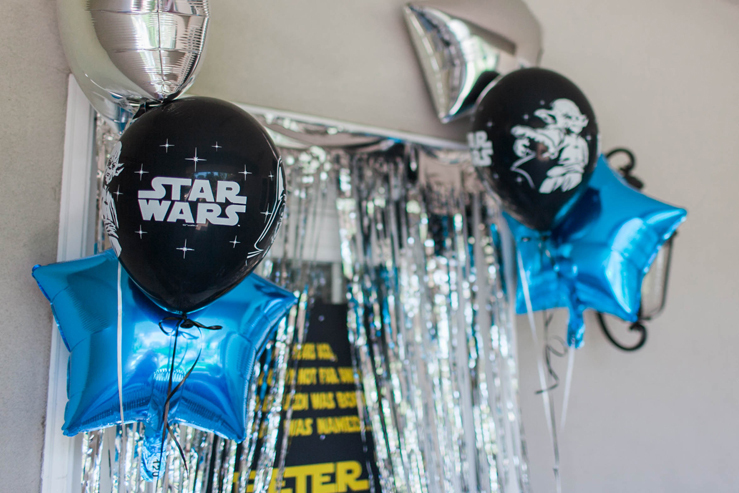 I love to decorate the entrance to the door a bit, so we hung Star Wars Balloons, silver streamers, and a fun printable sign that mimicked the beginning of the movies! 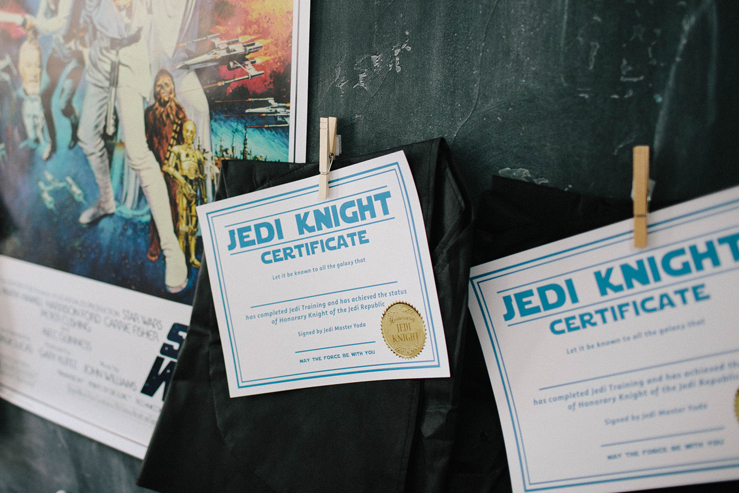 When the kids walked in, I had Jedi robes, lightsabers (I bought the lightsabers in bulk), and Jedi certificates waiting for them. They could choose between the black robes for the Dark Side or the traditional brown Jedi robes. 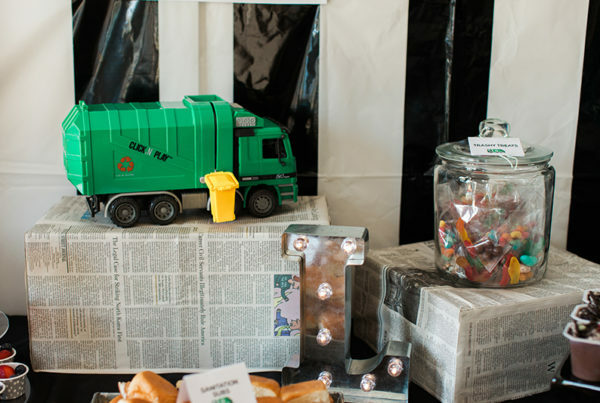 I love themed food for a kid’s party. This was the first year my son was able to understand the puns behind the food, and he was absolutely tickled. 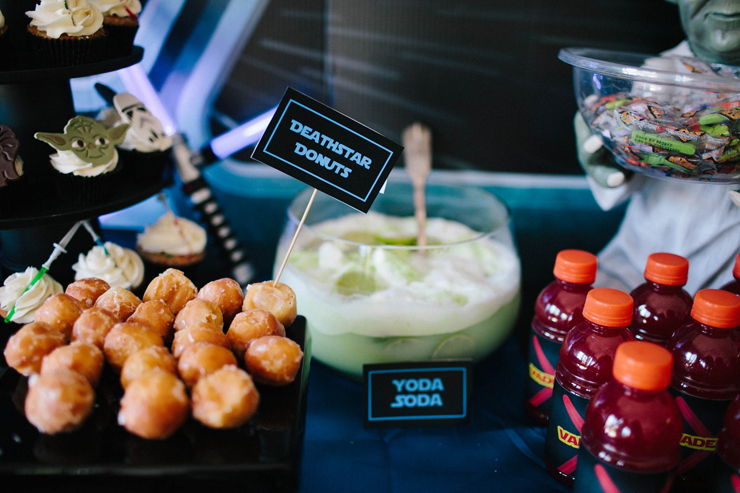 Our food table was comprised of sweet and salty snacks as well as some delicious drinks to wash it all down! 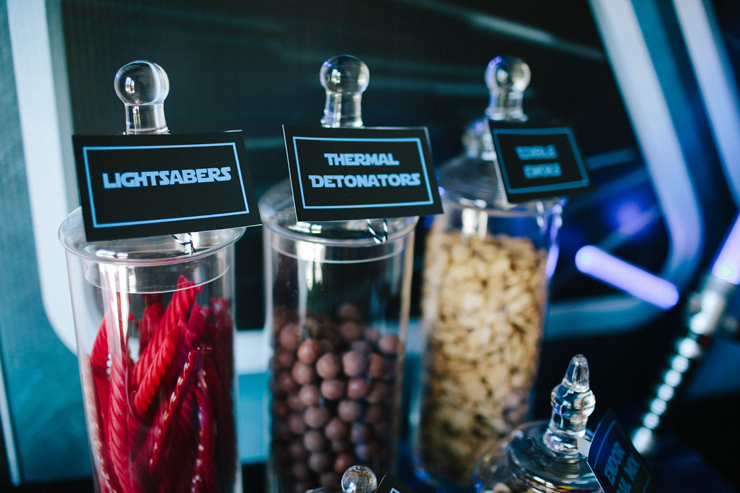 Kids could satisfy their sweet tooth with Thermal Detonators (whoppers), Light sabers (licorice), and Death Star Donuts. 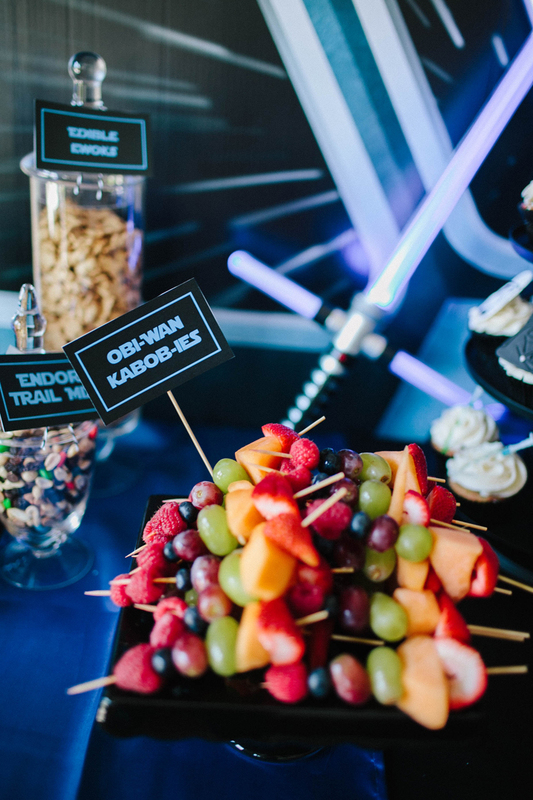 We also had Edible Ewoks (Teddy Graham crackers), Endor Trail Mix, and Obie Wan Kabob-ies if they wanted something a little more on the healthy side. 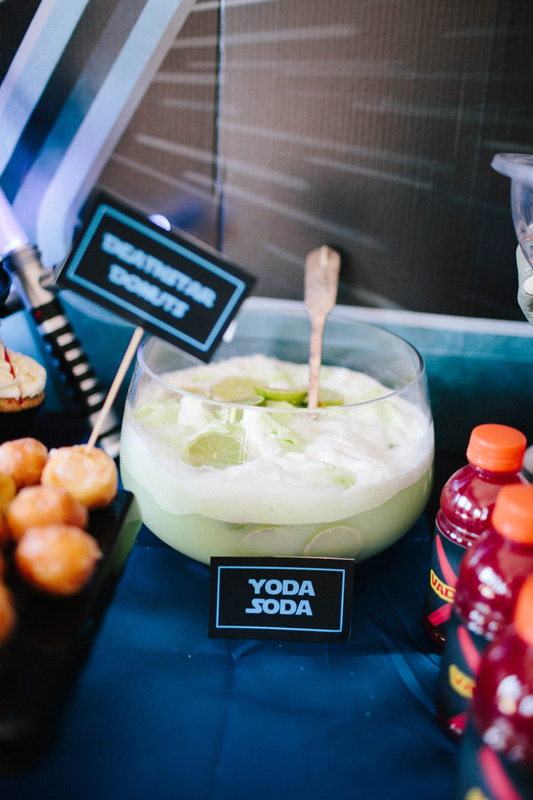 Kids slurped down Yoda Soda and Vaderade. 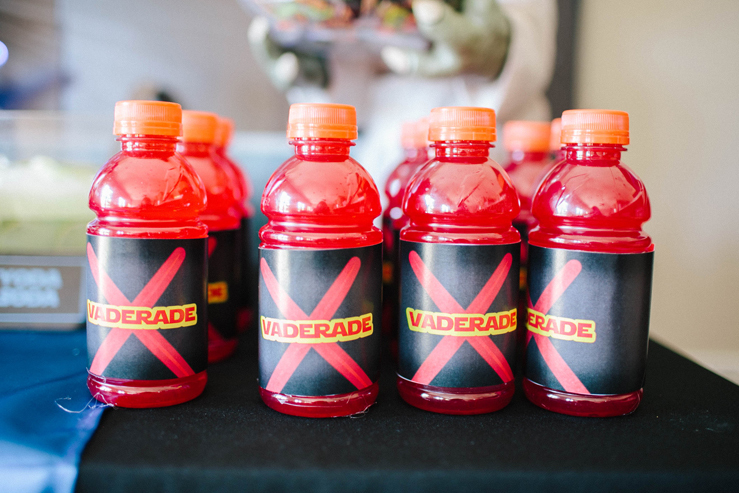 The Vaderade was my sons favorite, and the play on words seemed to be a hit! 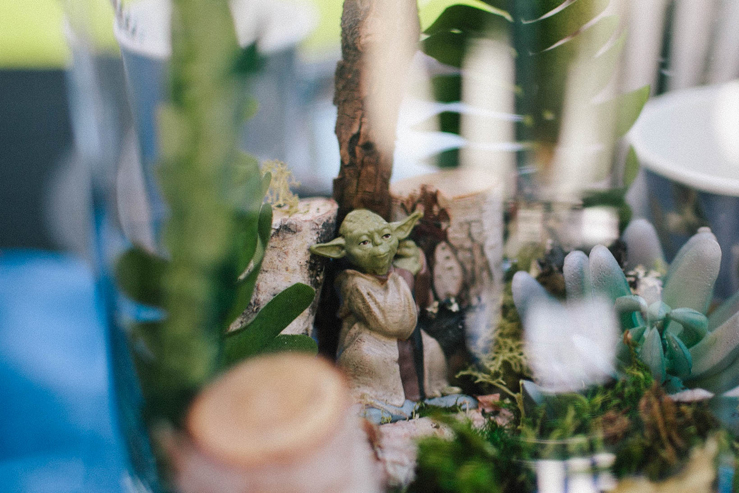 Yoda Soda is so easy to make! Combine one Liter of 7up, a half gallon of lime sherbet, and a can of pineapple juice for a delightfully green concoction! I garnished mine with sliced limes. 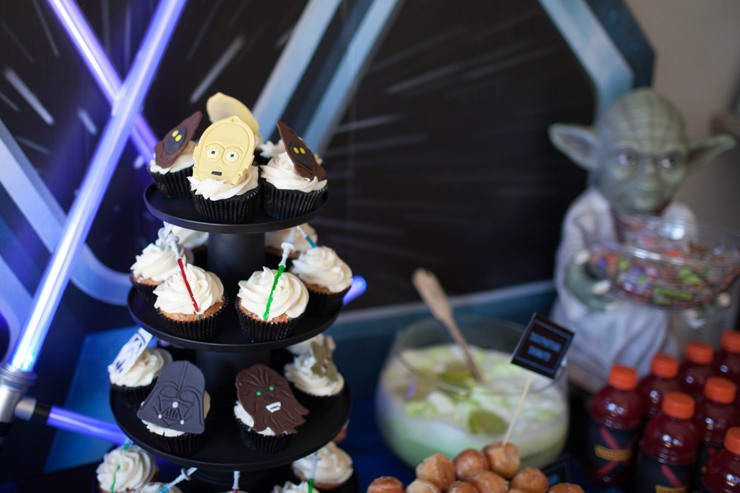 I have to admit I did not make these amazing Star Wars cupcakes myself. I have always had a problem finding somebody that can make amazing cupcakes for my parties, but I have a party hack that is tried and true — I buy (or bake) plain cupcakes, and adorn them with custom toppers I order from Etsy. 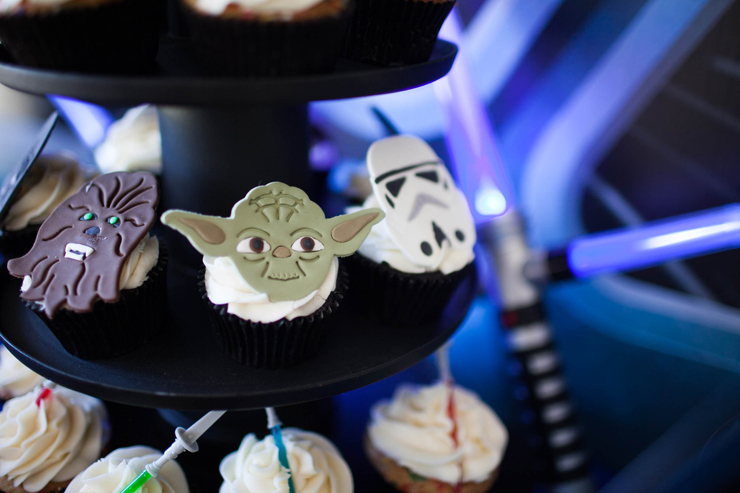 These Star Wars fondant toppers were super cute and were the perfect touch to the dessert table. There are so many amazing bakers on Etsy that sell pretty much any fondant design you are looking for. You will save money and can still get ridiculously cute cupcakes! 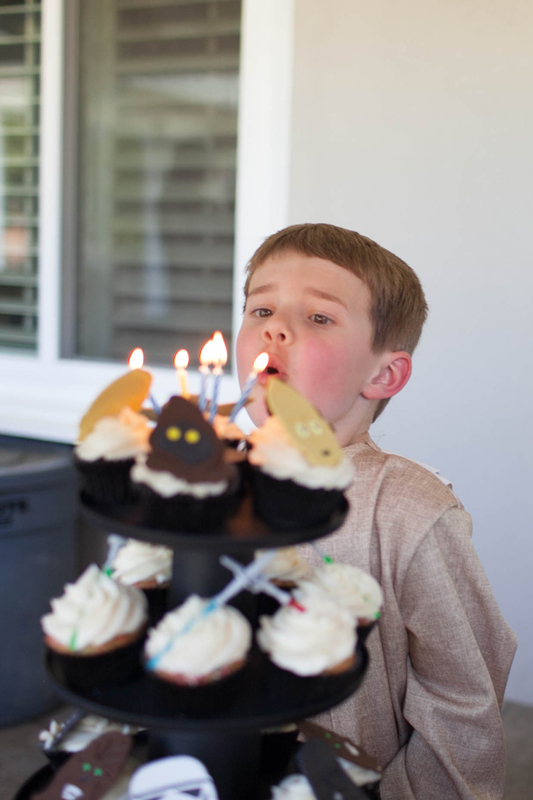 I also ordered lightsaber cupcake toppers from Amazon to mix it up. 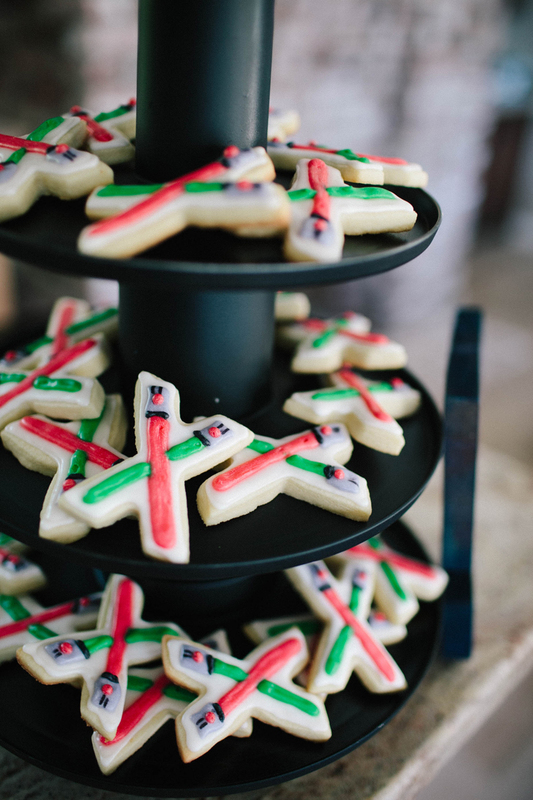 I made some Star Wars Lightsaber Sugar Cookies out of the Letter X cookie cutter for guests to enjoy, as well. The kids dined at a table outside. 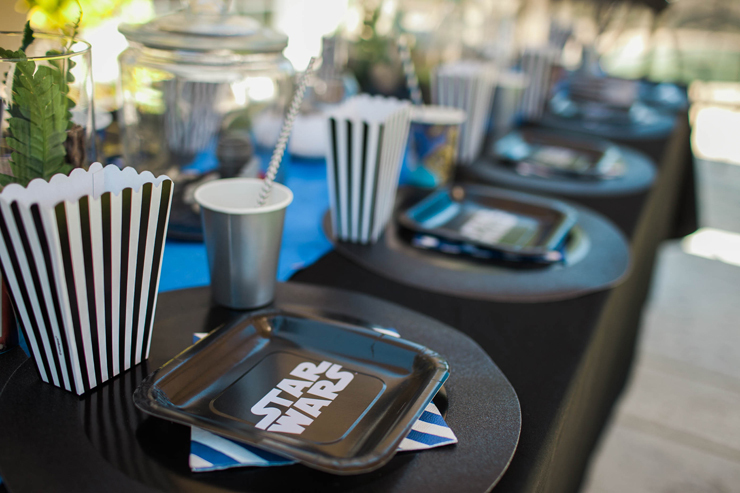 I carried my black and blue classic Star Wars theme over to the food table (you can find links for all of our Star Wars party supplies at the end of this post). I added a touch of glitter to bring some texture to the flat black tablescape. Using different patterns and prints is a great way to mix and match in the same color scheme. 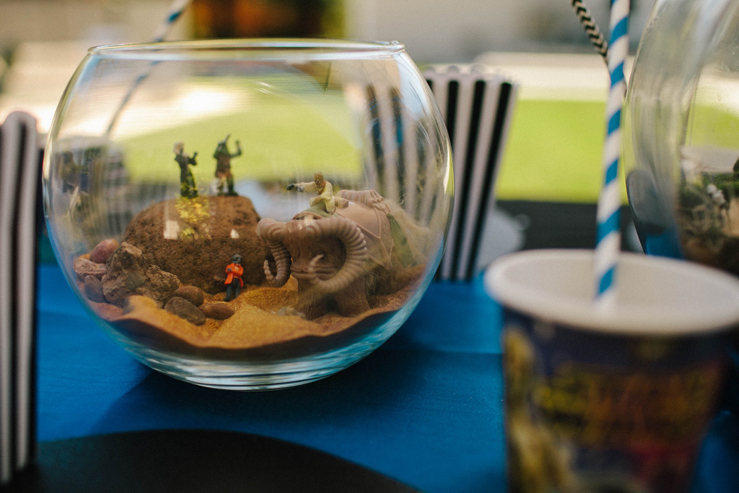 The centerpieces for the table took some thought and careful planning, but they ended up being my favorite part of the entire Star Wars party decor. My son fell in love with them, and all of the kids thought they were amazing. 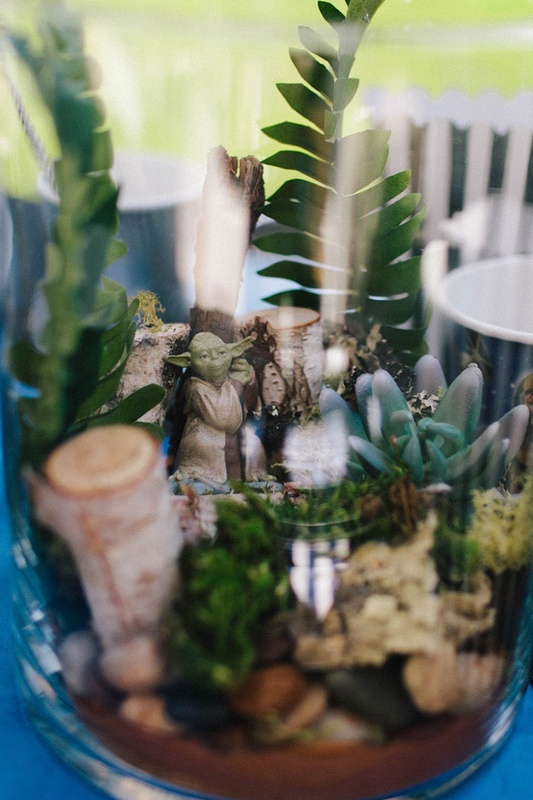 Inspired by all of the cute Fairy Gardens I’ve been seeing lately, I created little worlds from Star Wars in various glass jars, and then we inserted the little Star Wars characters who live there. 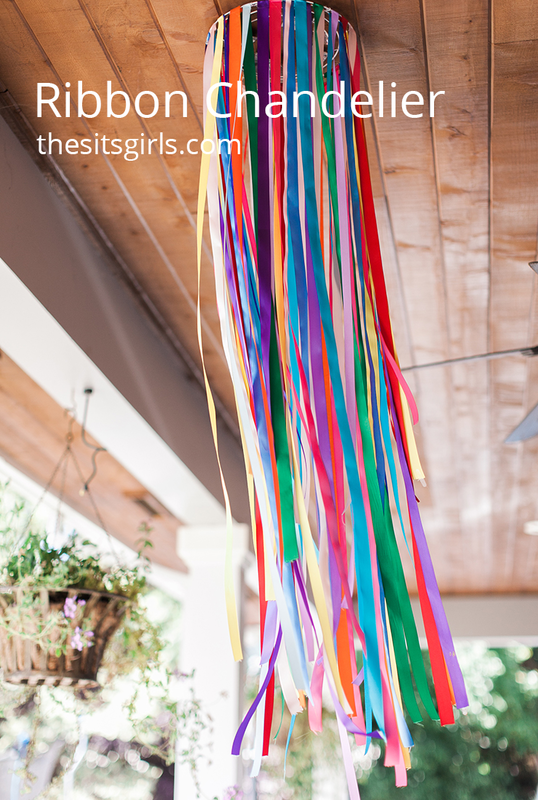 It was a fun project for my kids to help with before the party. 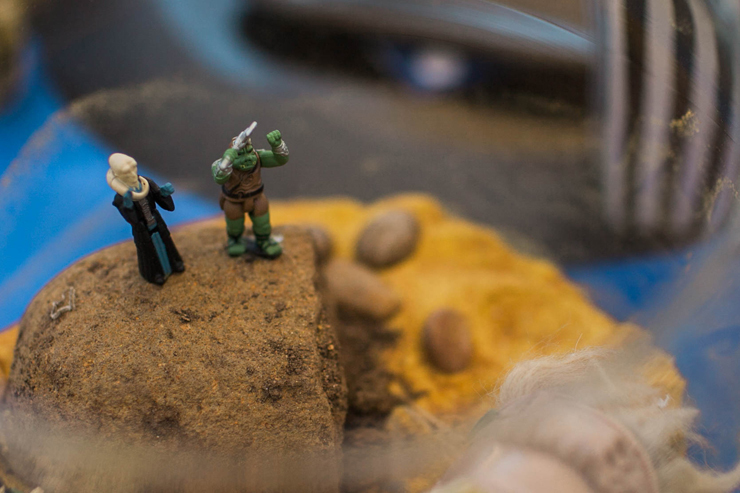 We created Bespin Cloud City, Tatooine, The Death Star scene, Endor Forest, Yoda’s Swamp Land, and the snow scene. 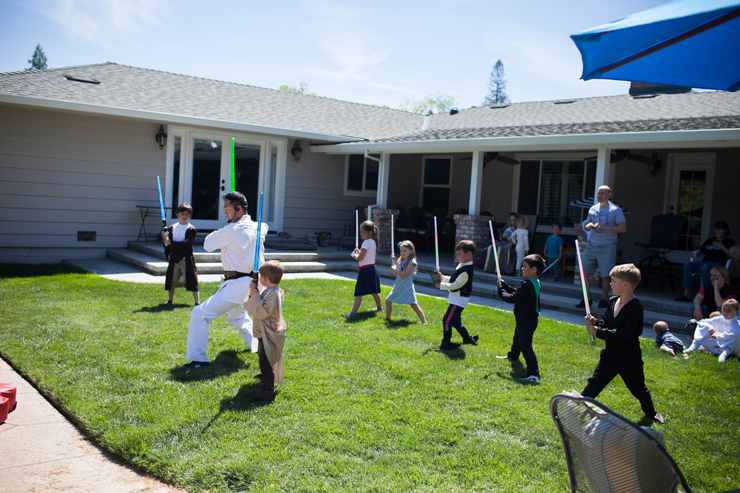 The best part of our Star Wars birthday party was the Jedi Training Academy. A local Martial Arts school has a Jedi Training class for kids, so I hired them to come and teach our little Jedi’s how to properly use the Force within them! 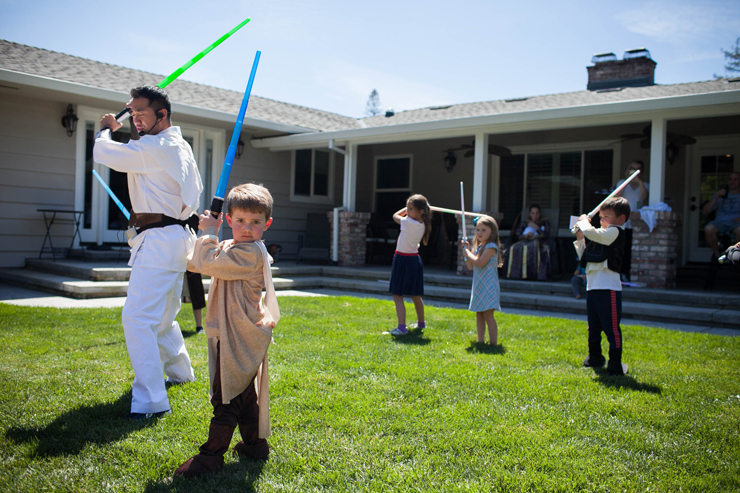 When the kids were done battling the dark side, they got to take their Jedi robes and Light Sabers home. 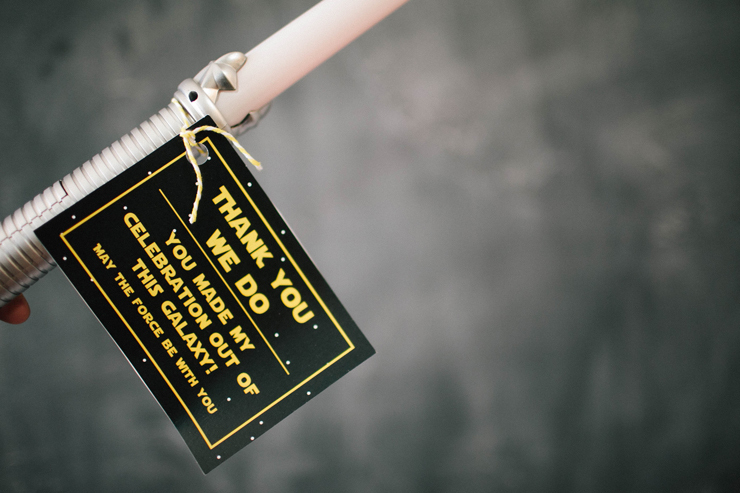 I adorned them with a cute thank you note inspired by Yoda himself! So far this is my favorite party I have thrown for my kids. The age and theme went hand and hand, and my son’s reaction was priceless! 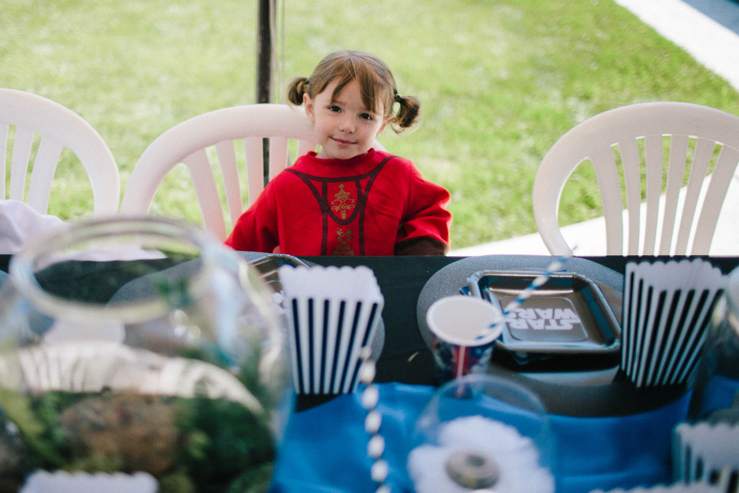 It was fun to create our own Star Wars memories in our backyard! 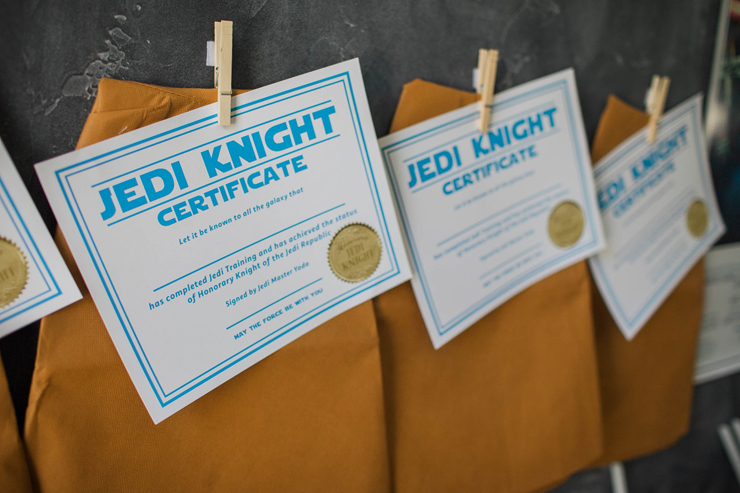 We can not wait for the next Star Wars movie, and will be practicing our Jedi training until it’s release! 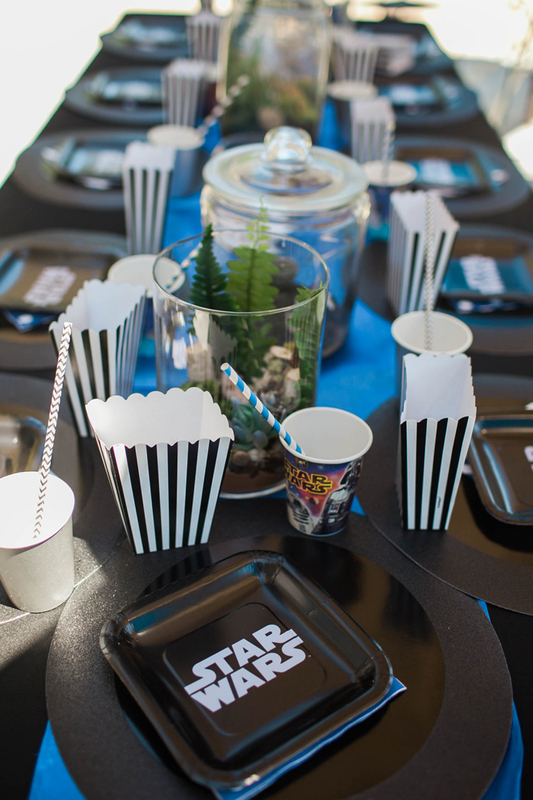 May the Force be with you as you plan your own Star Wars Birthday Party! 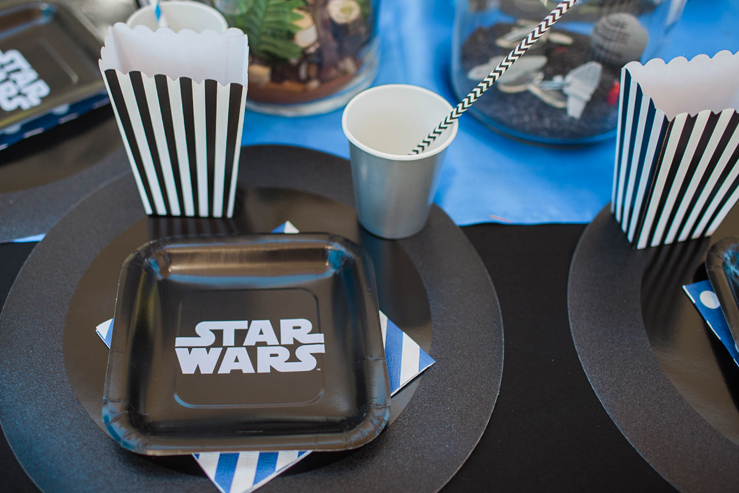 Need a little help styling your Star Wars birthday party? Here’s my shopping list! 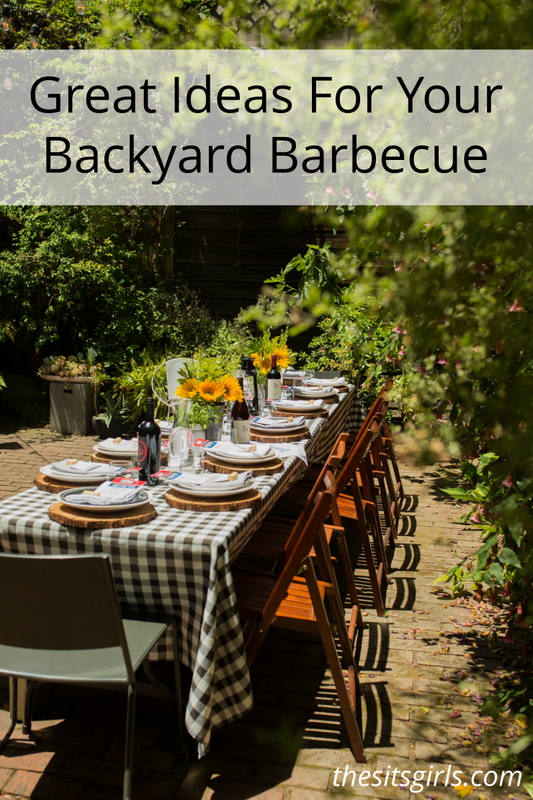 *Special thanks to Kelli Seeley for the photographs for this post! Next PostThis Homemade Hoverbike Really Flies!